Are you ready to increase your happiness? Are you craving more peace in your life? Ten minutes of supported writing time. In this busy time of year, give yourself the support you need. Rather than being just one more thing on your to-do list, this fifteen minute practice can literally transform your day and week. and it allows you to tap into your own deeper creativity. When we take just fifteen minutes for our own emotional maintenance and creative expression, we can be more present with ourselves, more present with our kids, more efficient at work, more understanding with our co-workers and partners. We feel happier, more in balance and we reclaim our agency and creativity. And we jumpstart the writing we are meant to be doing. After just a few minutes of meditation, our writing becomes much more clear, focused and powerful. Be led by the prompts, by poems, short prose sections, questions, and more. Sign up to join for free! ​Once you sign up, you’ll also be invited to join my free private facebook group to support your journey through the challenge. Don’t forget to share with your friends so they can reap the benefits of meditation and writing this season, too! Cant join the challenge, but interested in having lifetime access to transformative meditation and writing practice? 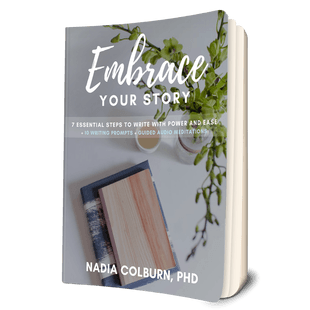 I’m Nadia Colburn and I believe that everyone’s voice and story matters. I help women (and some men) embrace the full power of their voice for a more just, sustainable world. I have seen that our inner work and our outer work must go hand in hand to get optimal results. I have an academic background in literature and creative writing—I have a BA from Harvard and a PhD in English from Columbia University and by my creative writing has been published in places like The New Yorker. I’ve taught at MIT, Lesley and Stonehill College, where I was a visiting writer, and, for the past ten years, in popular workshops around New England and in Costa Rica. I’m also a founding editor at the spirituality and social justice magazine, Anchor, published by Still Harbor, and a Research Scholar at the Ronin Institute. I’ve published poetry & prose in more than 80 national publications, including Spirituality & Health, American Poetry Review, Boston Globe Magazine, slate, Lion’s Roar and many other places, and my debut poetry collection, The High Shelf, is forthcoming in 2019. I’ve worked with hundreds of clients and students in New England and around the world as a private coach and as a workshop leader and teacher helping them come into their full potential. I work with individuals and with groups to use mindfulness and creativity to help facilitate optimal flourishing and a vision of the self in society. And I want to help you tell your story.